LUXEMBOURG--(BUSINESS WIRE)--The number of video households served by SES has continued to increase, reaching 351 million TV homes in 2017 according to SES’s annual market research, Satellite Monitor. 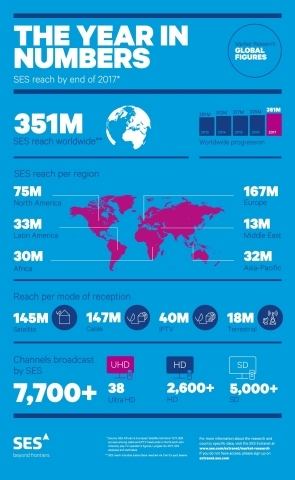 This substantial technical reach compared with 325 million households in 2016 means that SES is now delivering video content to more than 1 billion global viewers. SES’s increased technical reach reflects the expansion of the survey with the addition of new countries (Ethiopia, Tanzania, Uganda and Turkey) and the wider reach of Yahlive, namely in the Maghreb countries, together accounting for 17 million more SES TV homes. On a like-for-like basis, the technical reach grew by 9 million SES TV homes, mainly in Nigeria, Ghana and the Middle East. The Satellite Monitor shows that Europe continues to be a strong and resilient market where satellite broadcasting is a highly attractive platform for reliable and cost-effective video delivery to large audiences. SES now reaches 167 million TV homes in Europe, up from 156 million in 2016. This growth is mainly driven by the addition of Turkey and the additional reach of Yahlive in the Maghreb countries, which together represent an increase of 10 million TV homes. Technical reach across the core markets in Europe was stable. The study also shows the key role of SES to deliver HD content: today, SES delivers HD content to 107 million homes, which represents two thirds of all European TV homes enjoying HD. As the leading HD platform, SES carries 2,602 HD channels worldwide, out of 7,709 channels in total. In Europe, SES delivers 2,670 TV channels, including 798 in HD. In Africa, SES now reaches 30 million homes. In West Africa, SES has seen a strong growth with an increase from 3 million homes to 11 million in Nigeria, and from 2 million to 4 million in Ghana. Ethiopia, Uganda and Tanzania – which are being included in the Satellite Monitor for the first year – account for 7 million homes. Through Yahlive, a joint venture between SES and Yahsat, SES serves 13 million homes in the Middle East and South West Asia, up from 11 million TV homes in 2016. For the rest of the world, SES reaches 32 million homes in Asia-Pacific, 75 million homes in North America, and 33 million in Latin America.